What follows are 95 theses about faith and practice in Mennonite Church USA. Each one comes from my own experience as I’ve pondered what appears to be a shrinking moderate voice in the denomination. As a high school history teacher for over thirty years, I’ve been pondering the meaning of the five-hundred-year anniversary of Luther’s 95 Theses, and some months ago I began jotting down my own ideas, which eventually led to the following list. I write from a moderate’s point of view. I am hopeful for the future of Mennonite Church USA, yet I am also realistic about the nature of church institutions at the end of the reformation age. Perhaps posting these suggestions, musings, and observations on the internet door of our age can help our community discussions. At least that is my hope, so here I stand. 1. Think before you speak, because attacking a friend causes pain, loss of confidence, and sleepless nights. 2. Affirm a brother or sister ten times for good things they’ve done, and by then, your theological differences may seem less significant, but if not, at least you will have built a strong foundation for conversation. 3. Hold to the central historic Christian beliefs of the Creeds, the Councils, and historic mainstream Christian beliefs, recognizing that while these change over time, the core of faith in Jesus Christ as Lord and Savior is central. 4. Hesitate trying out the latest novel ideas about faith and new theological discoveries you’ve come up with just for fun—test them against timeless interpretations of Scripture in the Believers Church tradition. 5. Welcome the ideas of young people as, together, we seek to faithfully follow Christ, apply Scripture, and interpret the Confession of Faith in a Mennonite Perspective. 6. Learn to live with the tensions that come when two Assembly Resolutions appear to be irreconcilable, since that’s pretty much the way life goes, with unresolvable contradictions that dog us throughout life. 8. Avoid looking to political views or governmental policies for Kingdom ethics, moorings, or instruction for living—look instead to the way your community interprets Scripture. 9. Come together with bread and wine in Communion at the foot of the cross, accepting the elements with brothers and sisters who are different than you are. 10. Confess sins when conviction touches your heart, especially in community during worship, and accept cleansing through the power of the Holy Spirit. 11. Talk about theological and lifestyle differences in reasonable, rational, and calm tones, with truth, candor, and honesty, but without rancor, high-mindedness, or self-righteousness. 12. Forgive one another, love, and engage brothers and sisters who are different so that we do not create even one more denomination, since the 45,000 denominations in the world are enough already. 13. Work hard to maintain church unity because anything worth keeping or building is difficult, so roll up your sleeves and dig in. 14. Cook the best food you can for the next pot-luck at church, since the kitchen at church is a great place to work at unity while flipping pancakes, plugging in crockpots, washing dishes, and laughing with one another. 15. Respect the central administrative and faith bodies of your Conference, as those groups have highly committed men and women who are seeking to find a middle way between the polarizations of the day. 16. Challenge the central administrative faith body in your Conference, ask them to become more transparent, and to decide key faith issues of doctrine and practice more out in the open. 17. Think twice before you post opinions about a pastor or leader in a distant state or place, because you may not know enough about the situation to actually have anything worthwhile to say. 18. Find brothers and sisters with whom you can pray, often, deeply, and in the very Spirit groans of Christ, who hears our cries even before we utter them. 19. Encourage your pastors often, because they are walking the vale between competing voices that few of us not in such a holy office ever see or ever feel. 20. Tell your song leaders at church occasionally that you appreciate their work of choosing and leading songs, because such a task, which is often done on a voluntary basis, is hard work, and is difficult to navigate in an age of competing preferences of musical style. 21. Stop long enough in your church lobby to build church unity, both on the way into the sanctuary, but also on the way out, where we say hello, check in on each other, and speak a word of encouragement that may go a long way to support a friend. 22. Listen carefully to the academics in your church and learn from those trained in the biological sciences, medicine, law, psychology, educational administration, and theology. 23. Discuss your beliefs and opinions at Conference delegate tables, and work at the hard business of creating church unity by listening well and then clearly speaking your own opinions. 24. Help pay for lay members to get to church conventions, like Mennonite World Conference gatherings, as such an investment can yield good returns toward building church unity. 25. Consider yourself fortunate if you have family reunions where you can test your ideas and beliefs, give and receive feedback, and heatedly debate those who are different than you are, but still come back the next time ready to talk again. 26. Understand the peril and promise of posting beliefs about the church in social media networks that can positively impact others for needed change, but may also injure and harm in a screen-time digital environment that does not convey a smile, hug, or handshake. 27. Appropriate a genuine faith in Christ’s saving mercy and grace in our lives, and an understanding of our need for Spirit-led heart transformation, which can lead the church in the direction of unity. 28. Attend an alumni reunion or reception at the Mennonite College or University you graduated from, check in with friends you haven’t seen for a while, encourage new administrators, and laugh when folks from long ago tell you a good story or a tale. 29. Give faithfully out of the abundance you’ve been given as a powerful and God-given gift of the Holy Spirit that builds up, undergirds, and strengthens the staff and ministries in those institutions that count on your giving for their sustenance. 30. Invite new folks who come to church into your home for Sunday noon dinner, and so partake of the very presence of Christ in our lives. 31. Crochet sweaters for the babies in your congregation, and so bless those you give them to for a long time, perhaps even into the next generation. 32. Take time to listen to the student who calls you from the school you graduated from, speak to them cordially, learn about the institution you care about, and at the end of the conversation, make a contribution. 33. Provide feedback to your Mennonite alma mater when they ask for your opinion, and not later when you complain or grumble after the results of the survey have been posted. 34. Shed a tear when the tensions of denominational differences tear at your soul, whenever it may come, such as during a lovely song in worship, the beauty of a sunset, or the grasp of a baby’s trusting hand around your finger. 35. Rejoice with those who rejoice and weep with those who weep. 36. Make every effort to keep the unity of the Spirit through the bond of peace, as Paul wrote in Ephesians 4. 37. Read a church periodical so you know what others are thinking and writing about. 38. Stay in touch with the banter on church denominational web sites so you understand what a variety of people are thinking about. 39. Attend a church wide convention to find out what others from across the church believe and to see what they look like. 40. Sing like crazy when a song leader starts a song at church—it may lead to the redemption of your heart and enliven your spirit for the week ahead. 41. Invite your pastor to play in the praise band at church—he will be glad for the opportunity to do something different in worship than preach. 42. Teach your Sunday school class when asked, it will be good for your soul and it will help members learn more about you. 43. Read church periodicals and exercise judicious responses when you read stuff you don’t agree with. 44. Rejoice when a high school student you teach shows you an article you wrote in a church periodical, even though she took it from a Mennonite church lobby in a distant state when her choir sang in that church—she may get connected to the magazine and the church through it. 45. Provide copies of your denominational magazine to everyone at church, like your church used to do. 46. Invite four generations to your Sunday dinner table, eat outside in the warm weather, and feel free to talk about faith, always taking great care to listen well to the younger generation. 47. When your Conference administrator asks for help at the regional conference assembly, volunteer without hesitation. 48. Laugh deeply with your grandkids and instill in them the joy of living before they reach the age of one. 49. Attend other churches whenever you can and enter into their congregational life as if it were your own—because it sort of is. 50. Joke with those of another generation around your kitchen dinner table—it may be the very Spirit glue needed to keep the church going well in the years ahead. 51. When your District officer asks you to pray for another church nearby, do it, and often. 52. Read Christian theology from other traditions, like so far outside your realm of comfort that you begin to authentically examine your own beliefs. 53. Help the Sewing Circle at church make their next comforter. 54. 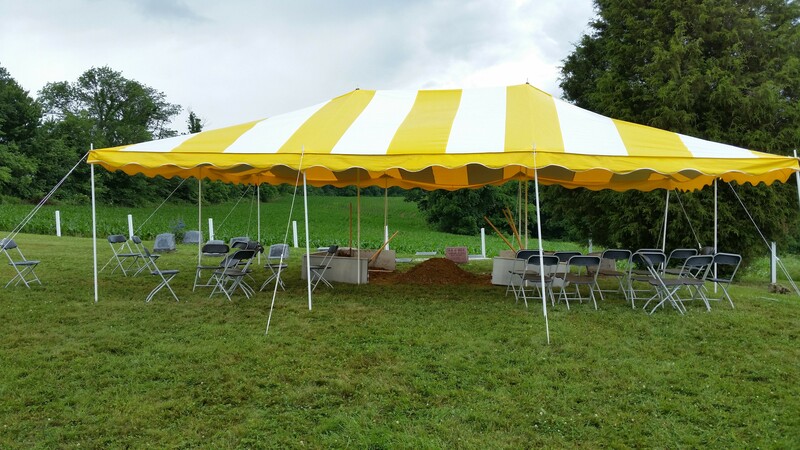 Work at a Relief Sale if you are asked—it’s one of the best inter-Mennonite events anywhere. 55. Hold your fire when a young adult writes something scurrilous or outrageous on the internet—you probably did such a thing once upon a time. 56. Accept the premise that change is a regular part of the human condition, and if you try to stop change, it’s like attempting to hold back the incoming waves at the ocean. 57. Ask a group of adults to go to a classic rock concert and have some fun—it’ll help you when it’s time to talk about faith at church. 58. Go to a bluegrass jam in your community, and if you play an instrument, string it up, tune it, and chord along with the sounds of heaven. 59. Sing gospel songs with abandon and so bring the lyrics of faith into your soul, your church, and your heart. 60. Lift your hands in praise and clap when you feel energized by songs that are led at church. 61. If you live in a Mennonite college town, listen well to a relative from a distant state who laments the loss of youth from his home church who go off to school and never move back home. 62. When you teach youth about the church and faith, don’t lecture—show them, encourage them, and allow them to talk about new ideas—you did that once. 63. Make your house a hospitable setting for talking about faith issues, and take time to sit and listen when young adults wonder, prod, and disagree with you or the church. 64. Mourn the need to release a conservative congregation when your conference delegate session calls you to do so—and do it just as fervently when a progressive church decides to leave. 65. Wish young adults happy birthday on social media because you may be one of the few in the church still reaching out to them with God’s love. 66. Pray for the Executive Conference minister in your area—the job must be one of the most challenging in the church. 67. Drive to the distant denominational Assembly with folks who believe and think differently than you—the hours of talk and listening in the van just might build a bridge or two. 68. Volunteer when the Gifts Committee at church asks for your help—do it if you can—serving on a Gifts Committee is hard work when people keep saying no. 69. Look for the continuities of faith in your denomination while welcoming the inevitable changes that come over time—if you don’t believe it look at your high school yearbook and see how much you’ve changed. 70. Understand the power of the information age—ignore it to your peril—the world has changed as dramatically as it did when Luther and the Anabaptists began using the printing press. 71. Realize that the world of information changes everything in the church since we learn about events and decisions in distant places instantly, and the playing field of influence and power has completely changed. 72. Rejoice that a local congregation is still made up of people in pews and chairs who come together regularly to pray, sing, confess, and listen to one another, in person and without the use of information technology. 73. Enter into prayer for the church with mutuality in mind, seeking a genuine relatedness in a loving and trusting manner. 74. Pray that God would help you change and accept others who are different, not that God will change others to become more like you. 75. Accept the reality that most will affirm marriage between a man and a woman as God’s intent, but that others will believe differently and that living with such a tension is tenable and possible within a denomination. 76. Agree that institutions inevitably change, even religious ones, and that’s a normal human process, and actually much to be desired. 77. Find the courage to speak from a moderate’s point of view in sharing time during worship, both encouraging others but yet clearly calling for faithfulness to God’s kingdom. 78. Sit down with those on your right and left and listen to them before opening your own mouth—it’ll work much better that way and it will actually reflect God’s intent for human relationships. 79. Understand that soundbites from the left or right make the news, but the moderate’s diligent work over decades has the greatest long-term impact. 80. Listen to the left and right, but stand in the middle, because that’s about the only way civil society or church can survive in the long term. 81. Engage in a meaningful mission that is larger than yourself, and know that it may never be fulfilled in your lifetime, but still, begin and work at it. 82. Accept that if you’re a moderate you’ll get run over like roadkill in the middle of the highway, but get at it and don’t be afraid of the traffic. 83. Refuse to allow institutions to lock people into contours of belief and practice that are based on patterns of the past. 84. Respect Anabaptist groups who hold to practices such as coverings, plain coats, and traditional ways of life, and do not disparage them, as their communities are probably growing faster and may be more faithful to 16th century beliefs than your more progressive group. 85. Listen to wisdom from gray haired seniors in the church, but bend your ear closely to the voice of young people who have ideas that will change and strengthen the church for the future. 86. Travel the highway of church history beliefs and practice, and respect the past, but realize that roads change, they get moved, they vanish, and new roads emerge where none had been before. 87. Respond with wisdom when those on the left attack you, remaining silent if necessary, and when conservatives criticize your common-sense perspectives, reply in calm and charitable ways. 88. Lament the loss of the moderate middle, and exercise prudent fear for an increasingly divided public forum, be it the church, the state, or the federal government. 89. Write a letter to a large Capitol newspaper when you observe congressmen and women acting like middle-school children in the halls of power in Washington, D.C., who refuse to actually listen to members on the other side of the aisle. 90. Turn off the shallow commentators on the radio who make a fabulous income stirring up the fears of the populace. 91. Use images and music to communicate in this post-Reformation age, but continue to write and speak because sentences and thoughtful words are still the most effective long term means of building unity. 92. Attend Homecoming at your Mennonite alma mater and find out how others in your class have changed and grown. 93. Avoid hardline and predictable theological responses to the issues of the day because a refusal to examine another’s position, on the left, right, or middle, digs you in deeper to the rut you’ve created for yourself. 94. Challenge the fancy new ideologies coming out of academia that sound cute and trendy, because they’ll quickly vanish if not rooted in historic Biblical teaching that has anchored the church for millennia. 95. Utilize the perspectives of the global Mennonite church, ecumenical bodies, and interfaith discussions that may be productive for unity in MC USA. 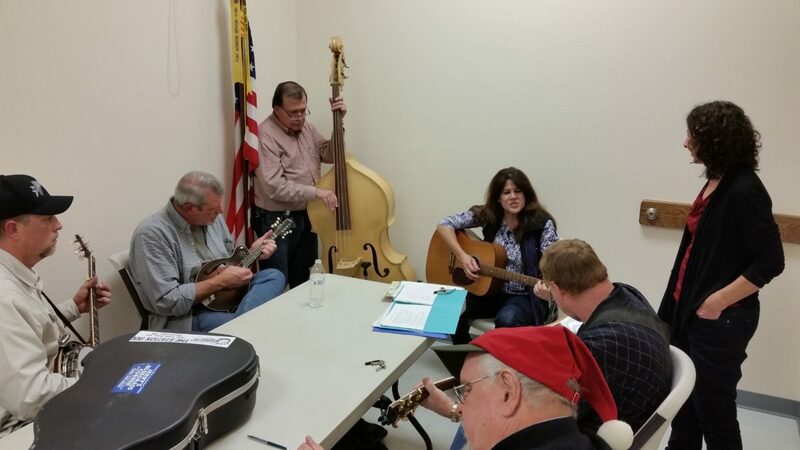 On the first Saturday of December, each year, our friends host a bluegrass music event in Timberville, Virginia. It goes from about 4-12 pm, and there are dozens of musicians and others who come to enjoy about six different rooms where groups of pickers make good music. Our group, December 3, 2016, played familiar gospel tunes. The historian got to turn an interior iron crank that released water at Silver Lake, Dayton, Virginia, which turned the early 20th century red wheel. The water flowed towards Cooks Creek, which drained towards the North River and eventually the South Fork of the Shenandoah River, which reached the Potomac River and finally the Chesapeake Bay. 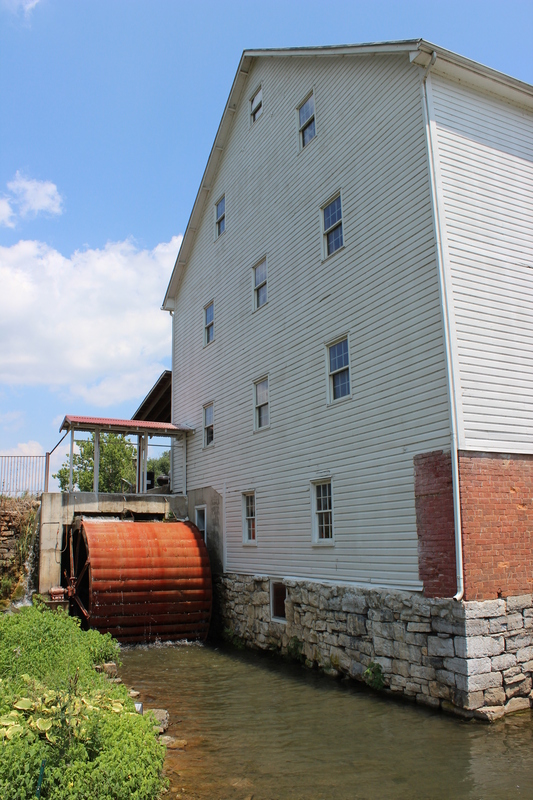 This mill was burned by Union soldiers during the Civil War and rebuilt after the war. As with the water which bubbles forth from the Silver Lake springs and ends up in the Atlantic Ocean, so our lives are interconnected and flow into the future in sometimes unknown and winding directions. It was a nice surprise to find a copy of the historian’s recent book about Weavers Mennonite Church on display in the Hartzler Library at Eastern Mennonite University. 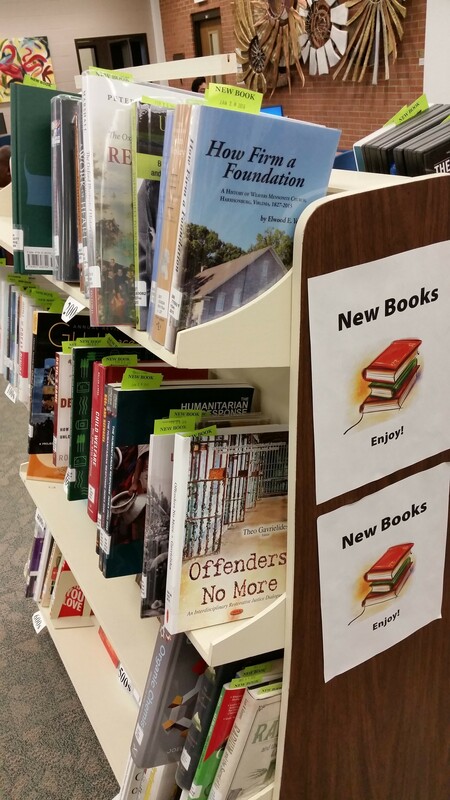 In a trip to the library, March 2016, to check out a book for research, it was a fun, serendipitous moment to walk by the new book shelf and see the work of five years. 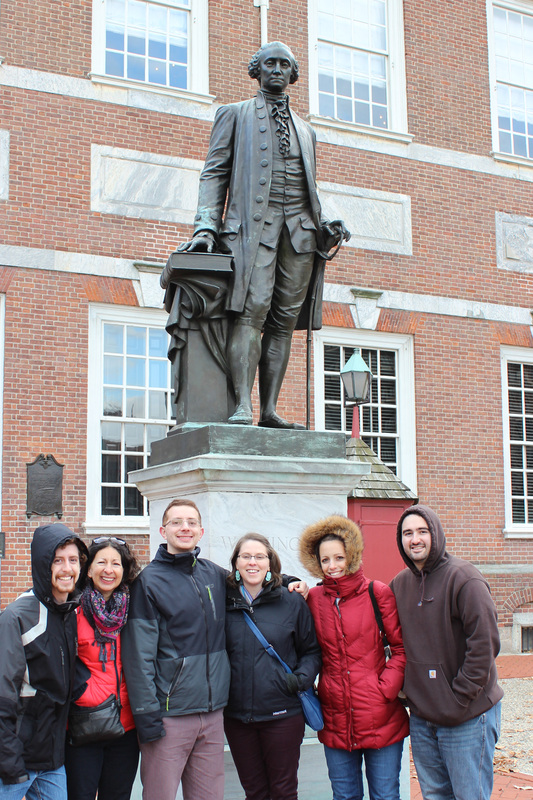 On a cold day in Philadelphia, December 2015, the historian’s family visited Independence Hall and enjoyed stopping in front of George Washington’s statue. With hand on a book, the sculptor captures the importance of our first president for his many accomplishments at a place where both the Declaration of Independence and Constitution were drafted and signed. In his other hand he holds a sword, symbol of his role as Commander in Chief of the Revolutionary forces. My family and descendants to come in this great land are indebted to you, President Washington. Pleasant Grove Mennonite Church had its beginning in 1885, started as a missions outreach of the Northern District churches of the Virginia Mennonite Conference. Today the building is still usable, but no congregation meets there, except for the occasional special service. At the time of this photo, 2015, the pews were still in place inside, with hymnbooks, and a pulpit up front. One hundred and thirty years after it started, the church is closed, begging for research and study on the factors that led to its decline. Pennsylvania 2015 brought together over 7000 Anabaptists from around the world, representing some 80 countries. Worship was inspiring and the speakers spoke of their lives in the global south. The Brethren Choral Sounds Choir from Zimbabwe (pictured) thrilled the audience with their lively and energetic music. Nearly five centuries later, from their early 16h century origins in Switzerland, Mennonites are now a global people speaking many different languages, but testifying to a common faith in God. At the ancient Natural Chimneys in Mt. Solon, Virginia, July, 2015, three outstanding musicians charmed, entertained, and thrilled an eager crowd of listeners. Music lovers from many states gathered for three days of inspiring music. 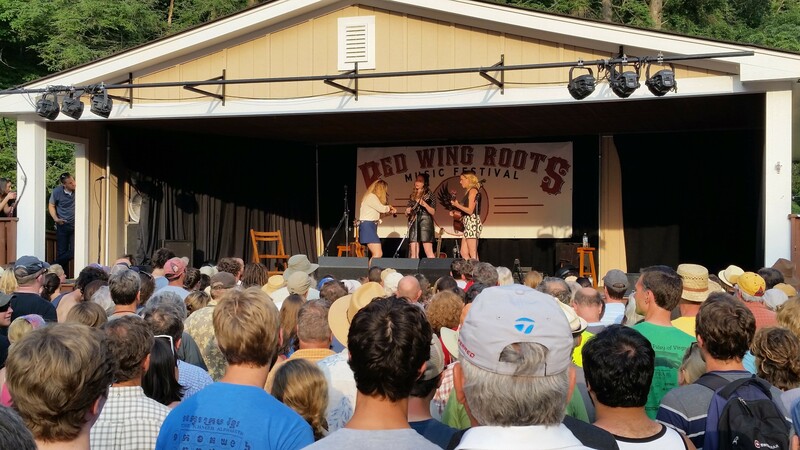 Sara Watkins, Sarah Jarosz, and Aoife O’Donovan performed fine acoustic music for grateful Red Wing Roots festival visitors. Uncle Denver S. Yoder, Sr., passed away after 88 years of life and was buried in a traditional Mennonite manner at the Calvary Bible Fellowship, Mt. Perry, Ohio, June 16, 2015. Denver was married to Emma for years, with 11 children, 64 grandchildren, and 136 great-grandchildren. The family gathered around and filled in the grave with dirt, shoveling by hand. Relatives who wanted to help were invited to participate. Denver S. Yoder, Sr., was a godly man and lived a good life.